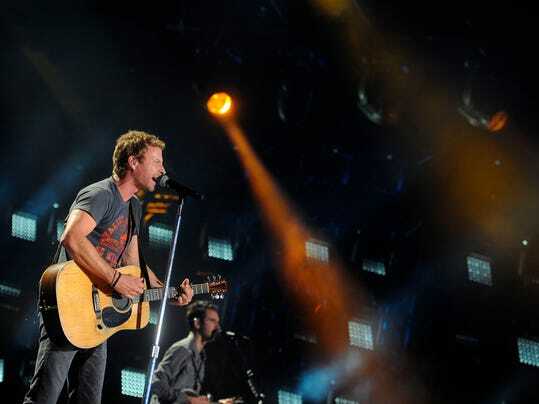 Dierks Bentley performs during the CMA Music Festival on June 5 at LP Field. He will appear on “Front and Center” on PBS. The intimate audience at Marathon Music Works on Wednesday night learned a few things about Dierks Bentley. For example, he told them about several songs he passed on recording that became enormous hits for other artists. He’s friends with the writers on those songs — many of whom joined him on stage Wednesday — and they pitched them to him first. “It’s all about the right song finding the right home,” Bentley told fans, explaining that “Drink a Beer” landed exactly where it was supposed to go with Bryan. The show was a songwriters’ night in honor of the CMA Songwriter Series’ 10th anniversary and was taped for an episode of “Front and Center” to air this fall on PBS. The confessions became a joke over the course of the night, which also included performances by songwriters Brett James, Ross Copperman, Jon Randall, and Jim Beavers. Bentley anchored the evening, and each man got three turns, with many of them jumping in to sing or play on someone else’s song. Bentley used his turns to share stories and songs including “What Was I Thinking,” current single “Drunk on a Plane” and “Pretty Girls,” which is from his new album, “Riser.” But since all of the songwriters on stage collaborate with Bentley, the crowd got to hear plenty more of his songs. Randall sang “Am I the Only One,” and James talked about knowing “I Hold On” would be a hit as soon as he and Bentley finished writing it. Then they sang the song together. Copperman, who produced “Riser,” performed “Tip It On Back,” and Beavers, who has been writing with Bentley for 15 years, joked about pitching the singer the idea for “5-1-5-0” as Bentley was walking out of Pilates class. Bentley paid him back by gently sparring with him over the fact he had his iPad mounted to a stand in front of him in case he needed help remembering lyrics. The taping is one of two planned country music episodes for “Front and Center” that will air this fall leading up to the CMA Awards. The second features Lady Antebellum and also was taped on Wednesday at the same venue.